Interzone entering closed beta despite $1.5m in outstanding debt – Nick. 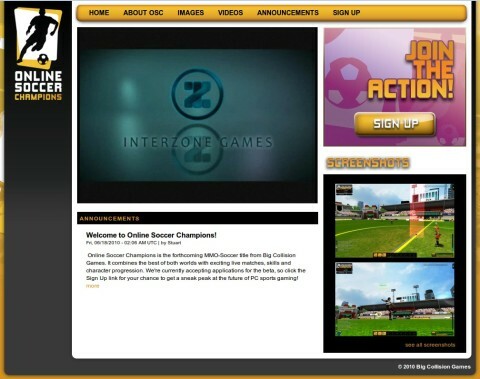 I read yesterday that Interzone (operating as Big Collision Games) is launching Interzone Futebol (now branded for North and South American launch as Online Soccer Champions) into closed beta, despite still owing over $1.5 million to former employees of the Perth studio and the Australian Tax Office. I paused the launch trailer on the opening logo, which still reads “Interzone Games”. Indeed, it appears to be the same trailer released for Interzone Futebol back on August 2009 (and featured on the Gamigo Futebol website). For those of you who haven’t been following the news regarding Interzone Entertainment (site currently down), the webpage “Interzone: The Downward Spiral” has been collecting related news articles and online information pertaining to the company’s activities. Sadly, there has been little progress since that report. We would like to resolve any issues directly with you to avoid any legal costs. The funds that we raise will be limited therefore the less external expenses the more funds that will become available distribution. We accept that after external expenses you will have priority with any distribution or pay out. We will keep you informed on our funding progress as information comes to hand. Internal expenses must come before external expenses. Staff must be paid for work that they have already undertaken. Interzone has not kept former employees informed on funding progress or any new information. With the game now re-entering closed beta, this indicates that the company has funds to continue development and launch. Interzone has failed to respond to communication from the Fair Work Ombudsman and Fair Work Australia. It has also failed to attend unfair dismissal and mediation hearings. With funds available, why isn’t outstanding debt being paid? There must be some amount of money that can be assigned to paying down debt without compromising the ongoing operations of the company. At the very least, why isn’t Interzone engaging in dialogue with former employees and the ATO? Encouragingly, it appears that the announcement of Online Soccer Champions is inciting former employees of the Perth studio to maintain pursuit of their unpaid wages and superannuation. If anyone from Interzone is reading this, please feel free to contact me to engage in collective dialogue with former employees. Interzone Games may be setting up in Perth! Australian Interzone Futebol website live! I just noticed that the IZ logo reflection in the video is incorrect. It bugs me now. They finally broke off negotiations with me over the business name and logo over a year ago. They have, however, trademarked the logo in the US and Australia, despite the fact that they do not own it. I’ve considered sending a C&D, but figure I’d just be wasting my time. Definitely send the C&D – it can’t hurt and if you don’t, their lawyers can spin it that you never told them not to. I agree with Connie. Send the C&D you got screwed enough might as well have something else in writing against them.